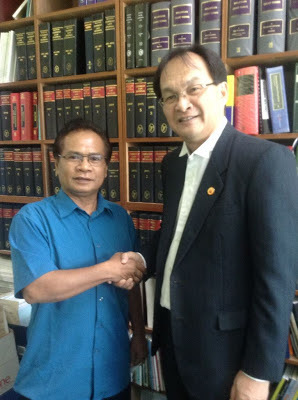 YB Baru Bian congratulating land rights activist Nicholas Mujah on finally receiving the Global Human Rights Defenders award from the International Foundation for the Protection of Human Rights Defenders (FrontLine) in Geneva last week. The award was made in 2010 but Nicholas was banned from overseas travel until recently. The award is well-deserved by this quiet and unassuming but resolute social activist. Congratulations, Nicholas!